To view the entire presentation, click here for the document (PDF). The report mentions about how the participating agencies are doing in their transition of monthly passes & tickets and how much of their customers are using the Clipper card over other fare media like BART tickets, cash fares, and those exempt from using Clipper (e.g. BART Plus & Muni lifeline passes). All participating transit agencies, except for VTA has transitioned their monthly passes/tickets to Clipper. VTA is planned to transition their passes at the end of the fiscal year (June 30th). AC Transit: 24.9% of boardings use Clipper on weekdays. Even though Muni has a lower percentage of usage of Clipper versus Golden Gate Ferry, Caltrain, and BART, Muni has over 50% of the weekday Clipper card boardings in comparison to the total of boardings for the combined membership of Clipper (approximately 330,000 Muni Clipper boardings per weekday vs. 575,000 boardings for the entire Clipper consortium). Muni has done their share of preparing the public for the big transition of moving paper passes and other fare media to Clipper. Muni has done outreach and marketing to the public, including opening up the SFMTA Customer Service office on select weekends to help youth sign-up for the Clipper card and receive their card immediately; versus waiting for one in the mail. In September 2011, Muni transitioned most monthly passes to Clipper only. However, paper passes are only available through the Lifeline program and the "P" pass for seniors and disabled whom pays an extra fee on top of the Muni monthly pass for BART access within San Francisco. From March 2010 to August 2011, Cable Cars accepted Clipper, but it was only for Muni monthly passes. This caused a problem with Clipper card users who wanted to pay with e-cash as the handheld readers could not deduct e-cash payments. This changed in September 2011 when Muni announced all Cable Cars can also accept e-cash payments as the conductors received new handheld devices capable of doing it. It's been over a year now with the new Muni metro faregates and it has been a love-hate relationship. There's been a lot of complaints and negative media exposure, but people have gotten used to it. From Muni's report, currently, the ticket vending machines at all underground stations issue 240,000 paper "Limited Use Tickets" per month. That's a lot of paper tickets issued and a lot of money at roughly $600,000 a year in these special tickets that includes Clipper technology. Ever seen what's inside one of those tickets? Click here. Reliability of the faregate equipment has been going very well with the machinery maintaining above 99.7% in the last six months. The worst in the past 12 months is when it dropped to 99.2% in April 2011. Still, 99% is pretty good versus the old Muni equipment that jammed, broke down, and non-functioning change machines. While the metro faregate equipment has been doing well, it's not great news for the vehicle equipment. For the past three months, equipment reliability has ranged from 96% to 98%, but has dropped to as low as 87% in May 2011. If Muni maintains a 96% availability, this means 1 in 25 buses/trains has malfunctioning equipment. Wireless antenna and software upgrades. Operators contacting Central Control of equipment problems (similar to reporting a broken cash box). Passengers contacting Clipper to report issues. 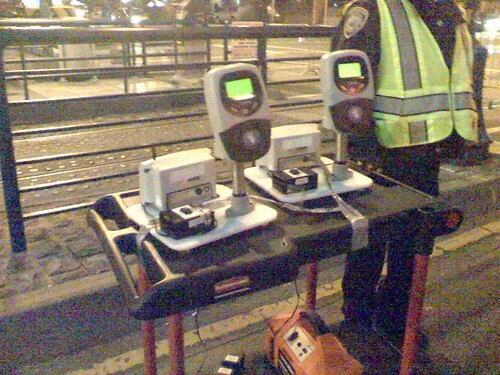 Fare inspectors carry Clipper card reading equipment to check if passengers tagged their Clipper card. But while 99% of inspections is just to verify if the transaction went through, there's always that 1% that might have a problem, and that's when their handheld equipment comes in handy. The reader can check the last ten transactions on the card, remaining card funds, what pass(es) are loaded, and what fare category the card uses. $7.6 million on Muni's fair share of the operating fees of Clipper for the region. $1.5 million for the metro's automation of fares. $600,000 for procuring the limited use tickets sold at metro ticketing machines. $1.1 million in Muni staffing. ($0.4 million) in savings for ending the paper fare products and reduction in cost for maintaining the faregates as the old gates broke down much more often. Muni justifies the estimated $10.4 million cost in favor of both the passengers and the agency iteslf. For the passenger it means being able to ride multiple agencies on a single card, and quicker boarding. For Muni, it means less cash handling as more are paying with e-cash and less use of the cash fareboxes, lower fraud from fake paper passes and transfers, and with no more paper pass sales means less resources and staffing needed as most can be handled online, at metro station machines, autoload, or at Clipper contracted retailers like Walgreens. Muni will be evaluating about possibly transitioning their other fare media to Clipper only, such as their passports, Cable Car tickets, and Lifeline passes. Will be working with MTC and fellow transit agencies on updating their technology to help benefit passengers with better reliability and experience. In the past year, Muni has done a lot to make Clipper a big star. Many of us give praise to the change, there are others who would agree the paper passes should still be the backbone of the system. Surely paper passes would still exist along with the Clipper card selling passes too, but lets remember that Clipper is a regional project spearheaded by the Metropolitan Transportation Commission and has forced agencies with a gun at their head saying to transition or lose funding. This happened to BART when the agency slacked off on transitioning their tickets to Clipper when the MTC threatened to cut their funding if they didn't do the transition by the last day of 2011. But is putting a gun to each transit agency's head telling them to go to Clipper a great idea? In some cases, it has helped agencies in certain ways, like reducing fraud from those who prints fake passes and transfers, less people needed to count the farebox cash as people pay with e-cash, more efficient buses as people use Clipper to pay for rides instead of spending longer periods of time feeding cash in the box, and less resources required to disburse passes to thousands of vendors all around the Bay Area. But going Clipper only has its problems too... boarding of Muni buses used to be quick when paper passes was the norm; just flash at the driver and go. Reliability of Clipper card readers on vehicles are not as reliable as the faregates that has over a 99.6% monthly average; if you assume 96% of vehicle readers are functioning, that means 1 of 25 buses/trains have a non-functioning reader; that's unacceptable and Muni loses money because the rules state if the Clipper reader is broken, the passenger scores a free ride. At least with Muni metro, if one gate is broken, just go to the one next to it. Lastly, I understand Muni has done some heavy campaigning to get youth and senior passengers to go Clipper only, but even with all this hard work, the members of the public who slacks-off on obtaining a new card blames the agency for "not doing enough" when plenty of opportunities has been given to get a new card. Is it really worth $10.4 million per year for Muni to operate Clipper? That depends on who you ask. Is the MTC giving some extra money to agencies to help pay for the brunt of using Clipper? That's an answer I don't exactly know. What I do know is that by going Clipper only, it's good public relations for the MTC and all the participating agencies by having a single card; that's been a dream of public transit advocates for a very long time. The transition of passes has also changed the way we buy them, offering us more opportunities to buy (online, phone and autoload) but fewer opportunities to buy it through traditional methods (visiting your neighborhood vendor). I've learned to adapt to the changes by visiting a metro station during the weekend to buy my pass when I'm out and about to explore the city. I don't really think they are giving a good estimate on the $10.4 million because of a few factors: (1) they are saving money on having people count hard cash and coins. Since people can pay their fares with electronic cash on Clipper and not needing to collect money from their (former) pass vendors, this means less staffing is needed to handle money. (2) While the report says the agency is saving money on less maintenance on the faregates, how about the bus and train cash boxes? Less cash fed in the box means less parts moving, and can reduce the need for maintenance as people continue to use e-cash payments. Muni could save more money by encouraging regular citizens who rides Muni infrequently, by telling them to get a Clipper card, instead of buying a limited use ticket every single time. It costs $600,000 a year to issue those metro ticket machine tickets and a good portion only gets used once and dumped in the trash. Get people on a permanent Clipper card and that estimated $600K will drop. Of course, tourists will still buy the limited use metro tickets, we can't stop that fact. Lastly, I don't like the idea of having Muni transition their visitor passports and Cable Car tickets to Clipper. Paper form is easier to handle for the visitors. For the lifeline passes, it's not a bad idea to go Clipper only so the agency can stop printing paper passes altogether. It happened at 10:20am Nov 1, 2011 at West Portal Station. I added value to my clipper for November with my Wage Work Commuter Card. I took the receipt and got on the train. The next thing I found out on the receipt was the Clipper card number that didn't match mine. I thought it could be a printing problem or I picked a receipt from prior machine user. I went online and checked my clipper card, but the transaction didn't go into my Clipper card instead it went to someone's card. I didn't know how it happened. I called the Clippercard.com to explain my story and seek for solution. They confirmed that the transaction actually went to a wrong account. I got the case number, and emailed my receipt, and a copy of my card number for the refund process. They said they would process the refund within 3 weeks. I waited with their promise. On Jan 6th, I called to follow up my refund. They told me they rejected my case because Muni told them that someone had already used the Clipper Card two times in Nov. I explained my situation again from the scratch, and they told me they will process the case again, and had a manager to email me the next Monday. I waited to next Monday, but no one had contacted me yet. I got frustrated to their promise, and had no confidence on using their services. Should I not expect a refund or just gave up to the situation to Muni or Clipper? I hope my case could alert other users when they are adding value to their Clipper cards. If Muni or Clipper isn't going to help you, I'd recommend filing suit in small claims. I'm not joking. If it was my money going to the wrong person and Clipper admitted to the error and wasn't helping when you keep calling up the chain, I'd sue. I have had an ongoing issue with Clipper card. I signed up for the pre tax program, they took money from my bank account to pay for a card that never worked. I had to mail the card to them, they confirmed it didn't works, and after countless calls with them, they confirmed they could not reimburse my money. So basically they stole my money and I cannot do anything about it. Is there a group of people that have had similar experiences and would like to sue Clipper Card? I know this has happened to many people. This is wrong for a company to promise a products and steal your money if their card is defective.